"These Caprices should be heard more often on guitar for the sake of the guitar. This is a musical feat well worth the effort and any one of the 24 could provide material for masses of practice and such a schedule should improve even the very best players. 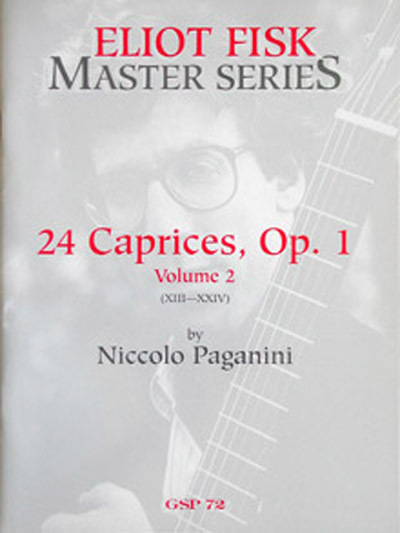 With comments, fingerings, exercises and advice from Fisk on these masterworks.&the editor has worked hard to present the reader with a solution and I can only recommend this sturdy issue to all of the Paganini devotees out there." "I'm sure many of you were blown away when you listened to the Fisk CD of Paganini Caprices, but now the transcriptions of his arrangements are now published!" "Finally, we have the book to accompany Fisks wonderful CD. This publication is exemplary!" "Now with these transcriptions, the definition of a guitar virtuoso is at a new level."